Mark Farrington kicks off today’s first demo lesson. Q1: He gets us writing. What do you think of when you think of the term “voice” in writing? 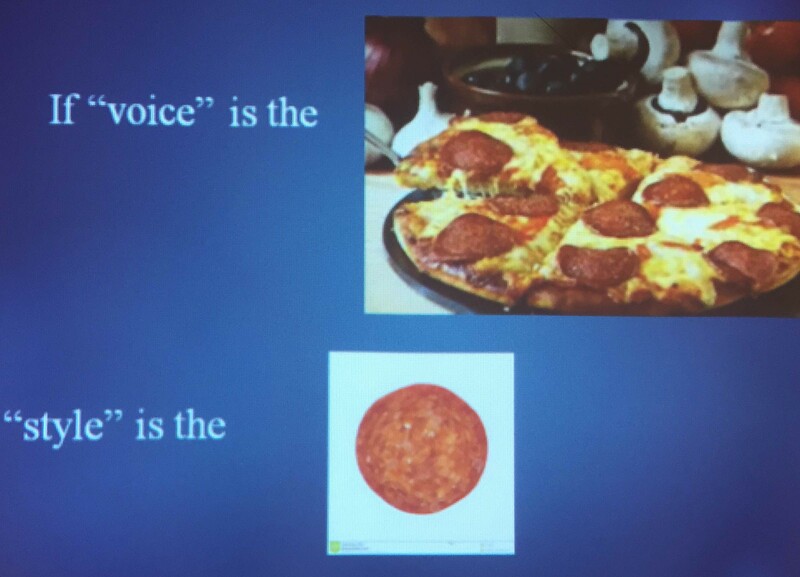 When I think about the term ‘voice’ in student writing I think about sound, about authenticity. I think about big things, like how developing a student’s authentic writing voice is perhaps one of the most important things to me as a teacher. How teaching voice can be difficult. Q2: Do you teach voice? What kind of things do you do? If not, why? We share out what we think. Hard to teach. Teasing it out. The magic dust of life and personality, the words they use, the tones they conjure, We teach it by tying it to audience and purpose. That there’s more than just a singular voice. Voice can be contextual. 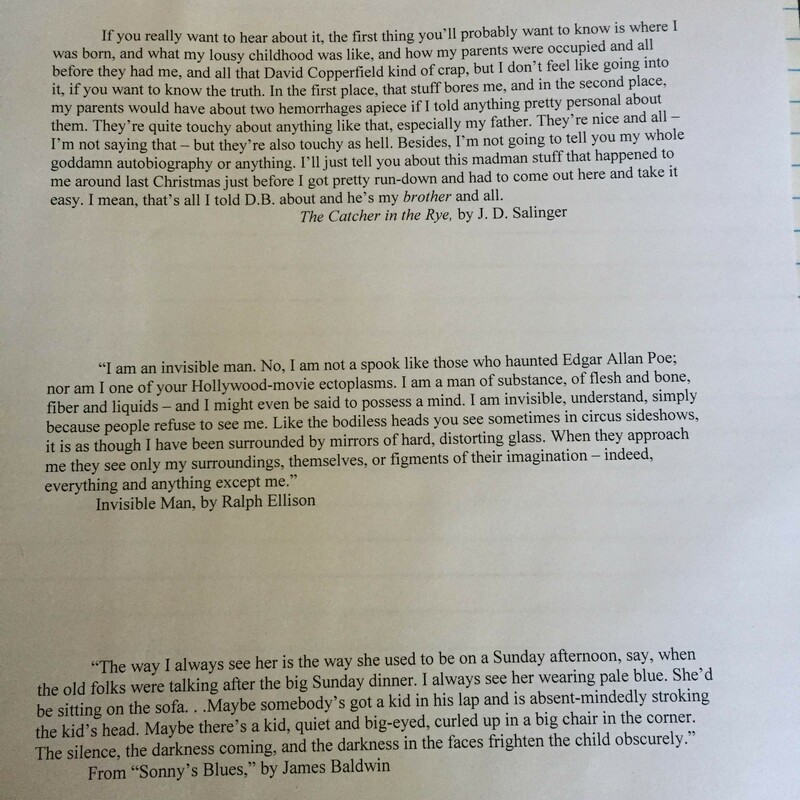 Writing to a bully, a grandma, a higher being. Shifting audience to force the change in voice. Taught a lot in the primary grades, that voice comes more naturally to children. We talk about the dangerous dichotomy for writers of feeling like “I can write like myself” or “I can be correct.” We discuss how the language of “ALL WRITING MUST BE IN COMPLETE SENTENCES” can go against teaching voice. We say teaching voice can be a good way to talk about fragments and clauses and phrases and sentences. Multi-voice. The difficulty of “taking the I out,” says a teacher. This makes me think about, again, Maja Wilson. Wilson cautions against barring the use of “I” in formal writing, that the personal has seeped into all but the most erudite of writing. 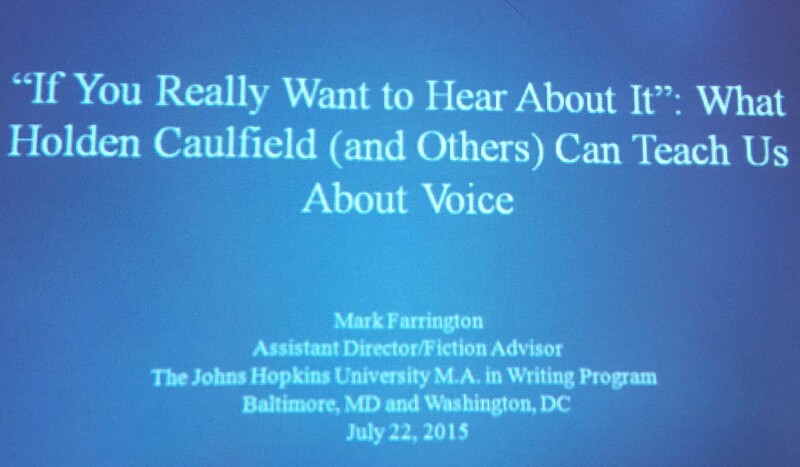 Mark wants to talk to us as both writers and as teachers of writers. He gives us a sheet with three paragraphs. What could we say about the speaker based on just the paragraph? We read the first paragraph. What can we say based on it? He’s a teenager. He’s cynical (mocking the reader, believing he knows what the reader wants, and refusing to do it). He is intelligent and at least somewhat well-read (the Copperfield stuff). Conflicted (hating the parents but also saying ‘they’re alright’). He feels aggressive. We talk tone (the speaker’s attitude towards things). Tone as the attitude behind the voice. This involves some close-reading, btw. Some real parsing of language. Love it! Voice can be personality, attitude, structure. What is told to the reader? What is left out? “This is not a happy story. I warn you.” -Great Falls by Richard Ford – So this sentence suggests perhaps a lack of warmth (short, staccato sentences), or maybe protective (trying to keep the reader safe from what it is they’re about to dive into) Does this voice have an agenda? What do you choose to tell? When do you choose to tell it? What are the expectations they believe are in the writing? Age? Background? Education? Culture? Economic situation? All of these things enter into who someone is as a speaker. 2. Who is saying it? 3. Who is being spoken to? 4. How is it being said? Q3: Here we pause to do some writing. Think of an experience you’ve had at any time of your life when you behaved in a way that might be described as “reckless” or “risque,” but might also be described as “fun.” Imagine you’re writing a letter to your closest friend in the world. They know you did something but not exactly what you did. Tell them about it in a letter. As anyone who’s spoken with me lately knows, I recently de-graded my class. I threw out all the grades (except the one that the county requires). I did it in my trademark, hap-hazard way, with seemingly minimal planning and foresight. I just sort of woke up one day and decided that I had to do it. That the students would make a portfolio that would lead them to come up with their own final grade. To others this probably doesn’t seem that reckless. To me it was a pants-shittingly terrifying experience. In my mind, I was willfully uncoupling myself from what every other adult in the building did. I didn’t really tell admin or parents; I just sort of did it. I wanted to see what it was like without submitting the process to the painstaking slowness and conservatism of the school bureaucracy. Q4: OK, now tell the same story to someone you want to protect. Think parents, grandparents. They heard that I did something, but they don’t know what. Just wanted to let you know that I’ve been experimenting with some different methods in my English class. I’ve been reading a lot of progressive thinkers, and I think I’ve caught the progressive bug. I made up my mind to de-grade my class. I don’t want you to think I jumped into this willy-nilly. I planned it out over a series of months, removing various academic structures every two weeks. Then we talk about the differences. Sentences to my mom had a bit more professionalism to them. I was coming from a place of wanting to neutralize any fears or concerns my mom might have about her son making such a bone-headed move. When he isn’t even tenured. So, how did audience affect the writing? 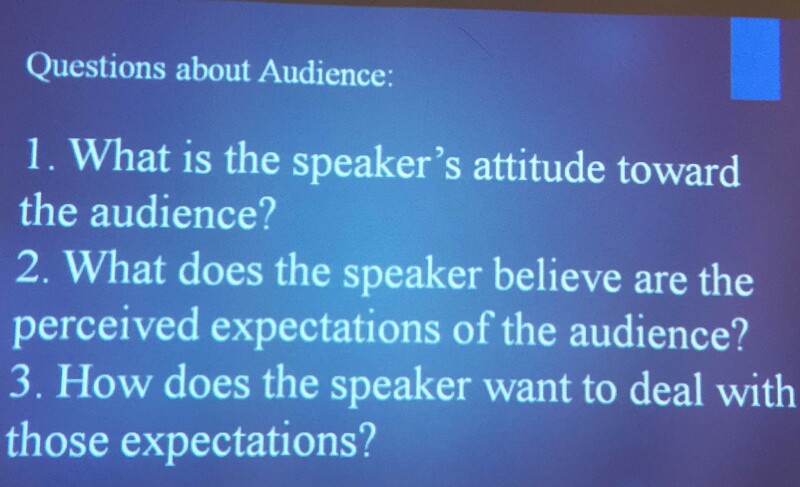 I really like thinking about this notion that the audience expects certain things of the speaker, and that as the writer you have the power to decide how you’ll deal with those audience expectations. Also a little side thought here about how students have to navigate a landscape of shifting audiences when traveling from class to class throughout their average school day. Mark talks to us about how we often see voice as a binary entity. A one true voice vs. absence. Mark says we have many voices. Consider: teacher voice, angry teacher voice, child voice, friend voice, a stranger voice. Voice is chosen. It represents a part of you. Like code-switching. We have many voices. The way you feel may be at odds with the way your persona / mask / chosen self needs to feel when writing this piece. The way you feel toward one aspect subject, form, writer, style, may be creating an obstacle for writing the piece. Voice reveals. Revealing can be risky. Exercise: Begin by making a list. Write quickly and add as many things as you can think of that finish the sentence: “I am a/n ___________”. This should draw from your multiple selves. Look for some of the provocative ways to answer it. Now, pick a term from your list that would engender some sort of “tell me more” response in the reader. Then write one paragraph where you begin with that one sentence and elaborate on it. What does that self I’m speaking with feel about the subject? I am a reservoir of absence. A capacious urn built to be topped off. A blackhole of want caught in an endless cycle of consumption (I am obviously not in a great mood today). The stuff people share out is so good. You could feel the different tone and the different voices in the chunks everyone reads. Mark gives a plug here for creating a room where everyone feels safe to speak from a voice of vulnerability. Now think of an image or a photograph of someone you have or have had a relationship with. The image or photo must be from a time in the past – at least five years ago. Think about this image or photo as pinning this person to a specific place and time, and you want to capture that person that person at that exact point in time (there may be other times when you’ve known that person). Think about what your feelings are when you think about that person at that time. How do you want the reader to feel about the person? About you? I’ll always remember watching television with my mom while I was in high school. Just the two of us. ACK didn’t get time to finish this! (These exercises, btw, make for amazing prewriting).